The Cleveland Indians open the 2014 season Monday night in Oakland. The Tribe is coming off a season that saw the team win 92 games and earn the second Wild Card slot in the American League. They did it by winning 20 of their final 25 games (including 10 consecutive to close out the season) as pretty much everything that manager Terry Francona did in his first season in town worked. The Indians enter 2014 looking to close the gap with Detroit in the A.L. Central Division, post consecutive winning seasons for the first time since the start of the millennium and go to the playoffs for the first time in consecutive years since the 1990s. To get ready for the season, we brought together some of the best baseball minds on the Internet to talk about what is in store for the Tribe this year for an installment of 5 Questions in 5 Minutes. Nino Colla from The Tribe Daily. He can be found on Twitter @TheTribeDaily. Mike Brandyberry from Did the Tribe Win Last Night? Follow him on Twitter @DidTribeWin. Adam Burke, formerly of The Cleveland Fan, and a contributing writer at bangthebook.com. Find him on Twitter @SkatingTripods. Andrew Clayman, founder of East of Ehlo. He is on Twitter @EastofEhlo. Al Ciammaichella from The DiaTribe. Find him on Twitter @Gotribe31. Question: The Indians were 4-15 vs. Detroit last season. Did enough happen in the off-season to close that gap? Nino: It will really need to be seen on the field if that gap has been closed. I think a lot of good things fell the Indians way in that the Tigers traded away the always tough Doug Fister and made some interesting moves that may take some time to gel. However, the question that remains is the Indians pitching staff. It more than anything has to make strides if they want to make a dent in that record. This will be the key to the division though, especially if the Indians want to win it. Mike: I think it is very possible the Indians closed that gap, but I’m not sure it is a real result of what the Indians did or did not do. I think it has more to do with the Tigers. Detroit changed managers and shook up their team. With that said, I think Kansas City is a team that shouldn’t be taken lightly this year, either. The Central Division could be as wide open as it has been in the last three to five years and it can easily be a three-horse race. As far as the Indians record against the Tigers last year, I think some of that is overplayed. Granted, Detroit had Cleveland’s number last year, but the Indians had success against the Tigers in 2011 very similarly. Adam: They say that “timing is everything” and that was pretty much the case for the Tigers last season. 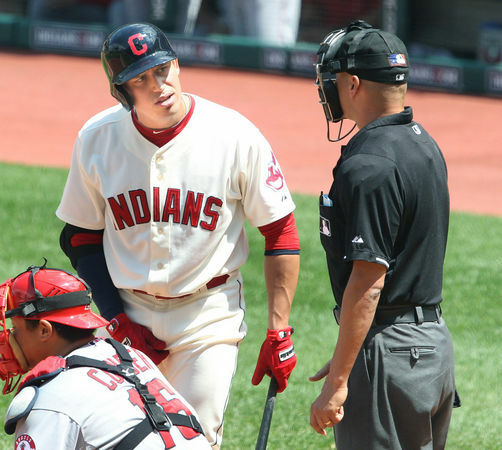 The Indians played 13 of their 19 games against the Tigers before the month of August and the Indians certainly weren’t playing their best at that time. The Tigers have a different makeup this season, with a new philosophy with new manager Brad Ausmus. But the starting pitching is largely the same. The Indians blew a couple of saves and had a couple of awful starts by Carlos Carrasco, and the Tigers caught Ubaldo Jimenez before he got into a rhythm. Expect a bit better record this season. Andrew: I suppose I could insert a joke here about how Justin Verlander, Matt Scherzer and Anibal Sanchez cower in fear at the sight of David Murphy in Cleveland colors. But overall, if we’re purely talking about offseason events, there is no particular reason to expect a dramatically different result in how these clubs will match up. The Tigers have legitimately improved (more speed and defense, far better ninth inning situation with Joe Nathan), while the Indians have stayed pat at best, with more question marks in the rotation and bullpen than last summer. It’s hard to bet on any team owning a competitive rival like that for too long, though, so here’s guessing the Tribe pulls out a few more this time around. Ash: I think so. The Tigers are still the clear favourites in the division but I do think the gap has been closed a bit. Despite the Indians not really adding much in the off-season, I think the Tigers got worse. Letting Doug Fister go will come back to haunt them, and Prince Fielder’s bat will be sorely missed. Plus, with the news that Jose Iglesias will miss most of, if not all of the season, they are even weaker. They still have a good team but if Miguel Cabrera gets hurt, they are in serious trouble. The big difference between both teams is the starting rotations; Detroit’s is established and dominant, with Verlander, Scherzer and Sanchez leading the way. Our’s on the other hand, whilst impressive last season, still have a few question marks after Justin Masterson. We’ll be closer this year, but probably still a step behind. Al: I’m not sure the gap has been closed very much, but I think they’ll be better against Detroit based on luck if nothing else. A few of those losses were pretty crazy (cough, Chris Perez, cough). It takes a decent amount of luck in addition to superior talent to go 15-4 against one team. Conversely, I don’t think the Indians will be as successful against the White Sox for similar reasons. So even if (when) the Indians pick up a couple of games against Detroit, they’ll probably give a couple back against Chicago. Question: Will Asdrubal Cabrera and/or Justin Masterson still be on the roster come Aug. 1? Nino: I think they both will be, and that’s because the team will be in contention. Recent news has the Indians and Masterson breaking off extension talks, which is fine; I think the two sides could still find a way to come to a short-term deal at the end of the year. Asdrubal Cabrera has a lot to play for this season and I think it will push him into having a good year, which only benefits the Indians in the long run, even if they don’t trade him. They can get a good year of production that hopefully results in team success and a draft pick. Mike: I think they will be because I think the Indians will be battling for the division and a playoff spot. If that’s true, I actually think the Indians could be a little more proactive on the trade market to acquire a piece to improve the team. As it looks now, Cabrera and Masterson will both be free agents at the end of the season, and the 2015 team will have a somewhat new look. Even if the Indians aren’t going to make big move to improve the team at the trade deadline, I don’t think they’ll give up on the season easily since they rattled off a 10-game win streak and climbed into the playoffs so late. Adam: Unless the Indians completely tank, which is very unlikely, Cabrera and Masterson will still be here on August 1. If the team is having success, it will be hard for Chris Antonetti to upset the chemistry and the qualifying offer means they won’t lose Masterson for nothing. Cabrera may have value if he has a better season, but the Indians will take their chances with him. Andrew: Well, any scenario where Masty is getting dangled at the deadline would seem to indicate we’ve wound up in a summer of massive disappointments. 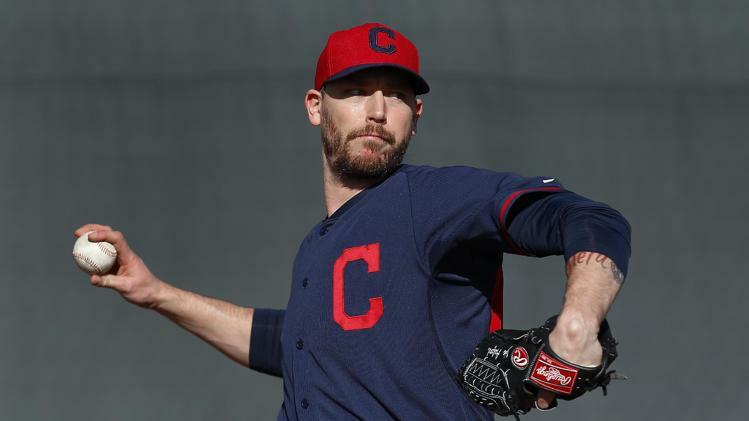 Even though he’s in the last year of his deal, it’s hard to imagine the Indians being both in the pennant race AND in a position to cut their losses with their ace. So … I guess I feel hopeful enough to say Masterson will finish the year in Cleveland. As for Asdrubal, it might be slightly easier to imagine a situation where the Indians trust enough in the work of Mike Aviles and the progression of Francisco Lindor to swap the expiring contract of Cabrera for some complementary piece down the stretch. Only problem is, if Droobs is struggling like he did last year, it’s hard to see any team giving up any remotely valuable asset for a mediocre rental, even at short stop. So, I’ll say both players play out the string. Ash: With the recent news that Masterson’s contract extension talks have broken down, it doesn’t look likely we’ll hold on to him now, which is incredibly disappointing. My heart hopes things get patched up and the club find a way to keep him long-term; my head says if the Tribe are struggling at the All Star break, they’ll trade him. He’s my favourite player and comes across as a really down-to-earth guy. It’ll be a real shame if he leaves. Cabrera on the other hand is nearly out the door already and the season hasn’t even started yet. I think the Indians will keep him around for the majority of the year, whilst Francisco Lindor gets some important seasoning at Triple-A. If Cabrera gets off to a hot start though, the club will definitely look to trade him whilst he still holds some value. His situation will be interesting to watch all year long. Al: Yes and yes. If the Indians were going to be able to flip Asdrubal for something valuable, they’d have done it already. He’s already been shopped around pretty extensively with no luck, so I can’t see them suddenly getting much for him as a partial-season rental. Stop me if you’ve heard this before, but he’s in the best shape of his life this spring. I think he’ll have somewhat of a bounce back year, and he’ll walk after getting a qualifying offer from the Indians. Under no circumstances will he be on this roster come April 1 of 2015, because it’s LINDOR TIME BABY! As for Masty, I think he’ll have a similar season to 2014 and then test the free agent market at the end of the season. I think the Homer Bailey overpay killed any chances for the Indians to sign him this year, so he’ll slide in to someone’s rotation after Matt Scherzer, James Shields, etc., sign somewhere to dictate the market. There’s a slight chance the Indians are able to get something done with him after the season, but it’ll likely be another qualifying offer and walk. The qualifying offer, draft pick and subsequent $$$ for the draft pick slot make it increasingly likely that the Indians hang on to both players even if they’re not in firm playoff contention on August 1. Nino: Any closer or bullpen will give any manager some sleepless nights. No bullpen adventure with a competitive team is calming, if it was, the team isn’t really contending for anything important. Will Axford specifically fill the void he’s been asked to step into? I think so. You have an experienced closer stepping into a role that is asking him to simply take care of the ninth. He’s accustomed to it, much more than anyone else on the team. It gives Tito flexibility in using his tougher arms like Cody Allen and Bryan Shaw, both more often and in the situations that call for it more than any other. Mike: I don’t think so. He’ll be solid and an average closer. He’ll blow a game here and there, but he seems to have worked out his mechanical issues and be more the pitcher he was a couple seasons ago. I think he’ll do an adequate job and help establish roles for Cody Allen and Bryan Shaw in front of him. Adam: Every closer has nights that result in a sleepless night for a manager. Axford has thrown the ball well so far in spring training and hiding the ball better should result in more deception. Axford also enters the season with just 120 plate appearances against American League hitters. A league change usually benefits a pitcher. Mickey Callaway has done a fantastic job helping his pitchers improve their control and a lower walk rate from Axford will make him very reliable, if not dominant. Andrew: I want to believe in a revival of the Axe Man this year. The dude’s got a good track record in the closer’s role, a stellar ’stache, and a penchant for arthouse movies and indie rock pretty much unheard of in the bow huntin’ world of big league baseball. He’s even letting fans choose his entrance music (I voted for Morricone’s The Good, The Bad & The Ugly.) Trouble is, I could also see that theme turning into a description of Axford’s season. The Indians haven’t had a stress-free, automatic, shutdown closer since vintage Jose Mesa. And we all know how that turned out in the long run. So predicting a stressful ninth inning is pretty much the easiest bet to make. Ash: I think Francona will sleep much better this year compared to 2013. Chris Perez and his nightly adventures have relocated to L.A. and I have a good feeling about Axford. His time in St Louis seemed to rejuvenate him. He worked out the kinks in his delivery, stopped tipping his pitches, and looked reborn, enough so to cash-in with the Indians during the winter. I have faith Axford will be a solid closer this year, holding down the spot until Cody Allen is ready. Al: Yes. He’ll ultimately be OK, but he’s a notorious slow starter and that’ll be an issue with Cleveland fans still scarred from the Bob Wickman, Joe Borowski and Rage Perez experience. I think he blows a save or two in April, but bounces back to give a league-average season as a closer. Even if he’s a disaster, Cody Allen and Vinnie F. Pestano wait in the wings. The closer position will be the least of this team’s concerns in 2014. Question: Is Carlos Santana a viable option at third base? Nino: Absolutely. He’s still out there in spring and if you can translate that bat over to third? You do it as much as you can. If Miguel Cabrera can handle it, Santana can. He’s more of an athlete than anyone thinks and he even played the infield when he was coming up. This isn’t foreign to him and it will extend his career, give the Indians the flexibility they need with keeping the DH spot open and on a rotation, and improve the lineup. Mike: I guess that all depends on your definition of viable. In my opinion, the bar isn’t real high at third base for the Indians. Lonnie Chisenhall has had the last three seasons to take the position, and has not been able to take control from the likes of Jack Hannahan and Mark Reynolds. I think Santana will play some third base and continue to be a work in progress and defensive liability, but Chisenhall doesn’t exactly remind anyone of Brooks Robinson at the hot corner. Obviously, the better Santana plays there, the more he will play at this point. If he can become an adequate third baseman defensively, even if not until 2015, he becomes a top level third baseman in offensive production. If Santana is a true viable third base option, it’s a product of his work and Chisenhall never taking control of the position. Adam: Santana should be a viable option at third base. The team has gotten by with Lonnie Chisenhall’s below average defense and Mike Aviles was also below average at the hot corner last season. The Indians should be able to pick spots to play Santana at third base. For example, opposing teams load the lineup with left-handed batters against Justin Masterson, which should limit ground balls to third. That could also apply to Corey Kluber. It will work in certain parks with slower infields (Minnesota, as one example) and against certain lineups as well. Andrew: I want to believe in this Axe Man, as well. Santana gives the Tribe a ton of options by manning the hot corner a few days a week. And while I haven’t given up all hope on Lonnie Chisenhall being a decent bat, it’s a bit silly to think that you’re sacrificing a ton of glove between Carlos and The Chiz. Lonnie’s got himself a cannon, but when it comes to the leather, Jack Hannahan he is not. So, yes, of course – Santana is more than viable as an 80-game experiment. He’s played third earlier in his career in the Dominican Republic, he’s got plenty of MLB experience at first base, has a great arm, and is basically being asked to make two and a half plays a game. Ash: I never thought I’d say this, but yes he is. I was sceptical about the idea when I first heard it during the winter, but Santana has won me over during spring training. He’s had his shaky moments but has played pretty well overall. I think he’s capable enough to man the hot corner once or twice a week, probably no more than that. He’s not going to win a Gold Glove there, but I don’t think he’ll be a total liability either. I still want Chisenhall to come good and hold down that position for the next decade, but I’m OK with Santana spotting him from time to time. Al: I’m one of the few people who think so. Seeing him take infield in spring training helped reassure me. He’s not an elite option over there by any means, but he looked much, much better when I saw him last week than earlier this spring. He doesn’t have to play 100-plus games there. I think he’ll bounce around between 1B/3B/C/DH, providing plus defense at DH and enough bat to make up for his deficiencies at the other positions. Question: The Tribe hasn’t made the playoffs in consecutive seasons since 1998-99, and hasn’t had consecutive winning seasons since 2000-01. What has to go right for them to break those trends this year? Nino: They need this pitching staff to pan out. The lineup will get the job done, the bullpen looks to have enough pieces and depth, at least, to make sure things are good in those senses. But there is a big question mark looming over this pitching staff, with two guys who had great productive seasons in Ubaldo and Kazmir gone. They can fill the void, they have options, but there are a lot of options and still a lot of unanswered questions. That staff ultimately has to go right, from Masterson continuing to be a reliable horse, to Salazar continuing to delight, McAllister and Kluber remaining consistent, and wherever else this team is going to get starting pitching from contributing. If that goes right, this team is breaking those trends. Mike: I think they’ll have a winning season, but I don’t think they’ll make the playoffs. They’re going to need to get quality starting pitching. Everyone just seems to assume Corey Kluber and Zach McAllister will have the same type of seasons or better than they did in 2013, and it seems Danny Salazar is expected to win 15 games. That’s a lot of eggs in unproven baskets in my mind. Salazar still has just 10 big league starts, despite great potential. I think it’s tough to assume he’s going to walk to the top of the rotation with Masterson. Kluber and McAllister had nice seasons, but there’s no guarantee they are going to become consistent and do that or better every season. I think the rotation is thin, too. If anyone struggles or is injured, the likes of Carlos Carrasco or Trevor Bauer stepping in and keeping the ship steered in the right direction seems shaky at best. I hope I’m wrong, but I think this team is destined for about 85 wins. Adam: Health in the starting rotation is the most important thing. People are overvaluing the losses of Scott Kazmir and Ubaldo Jimenez, who both had 4.00 or higher ERAs and FIPs through mid-August. If the starting rotation stays healthy, filling the void left by those two becomes a lot easier. It just so happened that Kazmir and Jimenez performed their best against a soft schedule when Masterson and Kluber were out. The current five could be as good as or better than last season’s rotation if they stay healthy. The offense will hit and the bullpen looks like a strength on paper. The rotation is the concern, but a healthy group will go a long way toward another playoff berth. Andrew: It’s obvious that Cleveland is going to need better output from its veteran hitters, pretty much all of whom underachieved last year – Michael Bourn, Nick Swisher and Cabrera in particular. But rather than focusing on them or the performance of our “future ace” Danny Salazar, I’m gonna let the season ride on the shoulders of last year’s quiet heroes—Corey Kluber and Zach McAllister. Their consistency kept the team afloat for much of the 2013 season, before Kazmir returned from injury and Ubaldo figured himself out. But both Kluber and McAllister are far from locks to repeat those performances this year. They’ve each had rough springs, and a major regression from either of them could have drastic repercussions. Sure, the Indians have some depth at starting pitcher, but it’s hard to be thinking World Series if Carlos Carrasco, Josh Tomlin or Trevor Bauer are serving as your No. 3 starter by mid-summer. As Kluber and McAllister go, so go the Indians. Ash: Health. The team must avoid serious injuries, particularly to the rotation. The depth is so thin there; we can’t afford to lose too many arms. 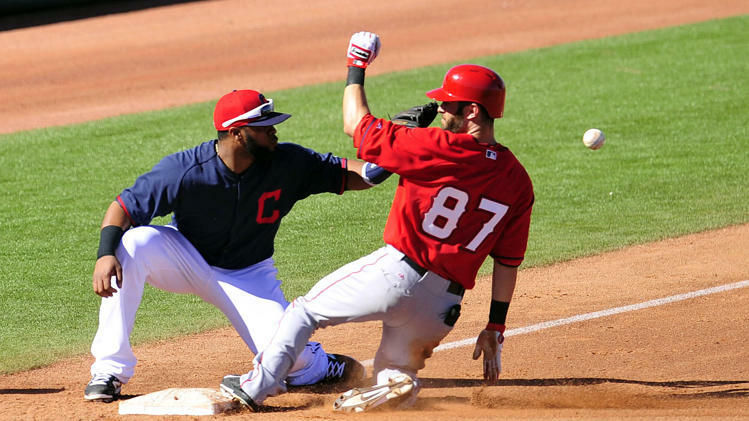 We need players like Jason Kipnis and Santana to continue producing like we know they can. I’d love to see Swisher and Bourn rebound this year, since 2013 was disappointing for both of them. Again, it comes down to health, because both guys were held back by nagging injuries all year long. And of course, we need a bit of luck to go our way. Al: Lots. 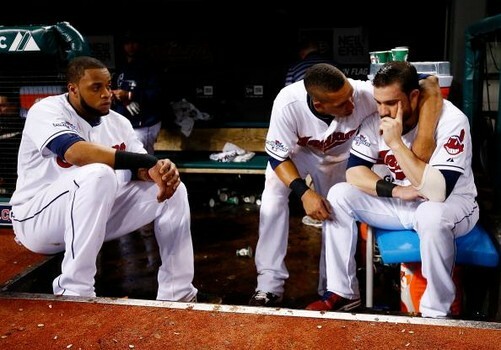 I think the Indians will be better than they were in 2013, but so will the White Sox, Royals and even the Twins. Remember, they had to win 10 straight to close out the season and secure a playoff spot. That’s a lot to ask from a team, and I wouldn’t want them to have to be in the same spot down the stretch in 2014. Danny Salazar has to pitch a full season similar to the tantalizing taste he gave us in 2013. Yan Gomes’ bat has to be real. Swish and Bourn need to bounce back. Asdrubal needs to be not useless. This is a good team, but not without flaws. They still don’t have a true ace. The lineup is solid, but streaky. I believe they have the talent to make the playoffs again, but I’m not betting on them to do so. Hope for the best, but expect the worst … the life of a Cleveland fan. Nice work everyone, there is a lot of good perspective in here, and thanks for participating. Things start for real tomorrow night with the Tribe. No matter what, it is sure to be interesting.